As a way to continue supporting students, we invite students to join the Alumni Association near the end of their enrollment period. Membership dues support the Excel University Scholarship program. With your generous support, we are able to provide cash and enrollments to accounting undergraduate students in accredited U.S. colleges and universities. The Excel University Alumni Association offers many benefits, discussed below. The Resource Library provides the content from your Excel University courses, but, without the CPE-related components. So, it makes a great way to reference the lecture videos, Excel files, and solutions after you have completed the course. When you join the Alumni Association, the system will locate all of your historical Excel University course enrollments and provide access to the corresponding resource libraries. 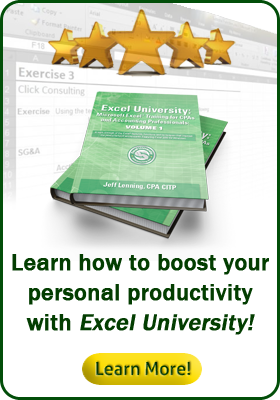 It is a great way to maintain an online library of all of your Excel University course materials. We'll invite you to attend four live workshops per year. There is no additional charge to attend because these are included in your dues. They are offered for CPE credit, so if you require CPE, these provide up to 4 CPE credits per year (if you attend them all). These are presented in small groups so that we have plenty of time for questions and for students to work along if desired. Post your Excel questions into the suggestion box to be considered in an upcoming workshop. These are typically digital downloads...stuff like ebooks, workbooks, and shared templates. The Excel University Alumni Association is available to students that have enrolled in an Excel University Volume bundle. Near the end of the one-year enrollment period, the system sends an email with an invitation to join. Dues are about $5 per month or $47 per year, and go to support the Excel University Scholarship program.